'Ohoy, mates! Go no further for here be monsters, argh! Sorry, but after receiving a box with Gee-dubs latest money sucking project there isn't really any other way, bad pirate puns is a must. Otherwise I think a gretchin will die horribly. 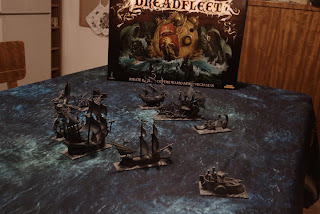 But Dreadfleet is name and pirates shooting at undead pirates is the game and todays work was to put the actual ships together. 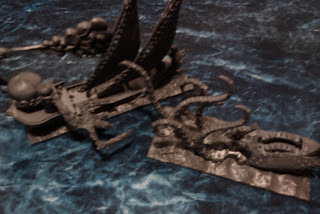 Apart from GW:s incessant need to put skulls every-freaking-where, it is an interesting box with lots and lots of little bits and pieces. 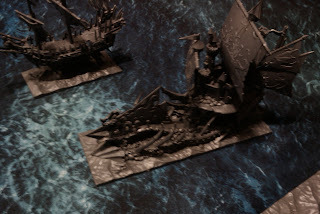 Ten ships, five on each side. Good versus evil or evil versus even more evil is perhaps more fitting... they are pirates after all. Well, enough blabbering! 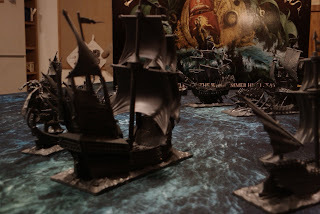 Behold ye landlubbers, the dreaded armada! After a quick look I'm really impressed, both with the cool design and how easy they were to fit together. 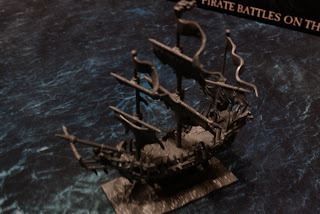 I'm also impressed (in a bad way) of how many skeleton skulls GW succeeded to put on each and every mini.